If we belong to Christ, the dominion of sin no longer dominates us. What does that mean? ”Dominion” means “to lord over.” It is related to “force,” “strength,” and “manifested power.” Before we were saved sin was our master. We lived under its control. It’s force or strength ruled our lives and we were powerless to stop it. We may have channeled it into certain areas and avoided it in other areas, but it was still our lifestyle. We were totally corrupt no matter how we manifested it. In Christ we have moved out from under the dominion of sin. Sin no longer controls us. We are no longer under it’s power or lordship. We have been clothed with the righteousness of Christ. We are now under the dominion of holiness and righteousness. Our lifestyle is the righteousness of Christ. Sin is no more an issue. OK, let’s talk about reality for a minute. Here is reality, as Paul proves in Romans, when Jesus died we died, when He rose we rose. Christ died to sin and rose to life. That is exactly the same position we have for we are “in” Christ. Whatever He did, or whatever happened to Him, God legally considers that we did it or it happened to us. That is the fact. Although none of us would ever admit it, the devil plants the unconscious thought in our minds that we are saved by grace and kept by works. When that attitude subtly creeps in we begin to live as if the dominion of sin was still a reality. We strive to please God. We are depressed and spend days, weeks, even years in condemnation because of a sin we have committed or have failed to get victory over. The bottom line is we are trying to live by works and not by grace. We realize that salvation is an act of God’s grace given freely because of the blood of Christ. We did not deserved and could never earn it. We need to see our walk with God is on exactly the same ground. We do not deserve our relationship with God and we cannot do anything to earn it. Our on-going relationship with God is based solely on God’s grace through the Cross of Christ. When we really see this then we will know that sin is no more an issue because it is Christ’s work, not my work, which counts. The dominion of sin has been broken. May the Holy Spirit reveal this to your heart. 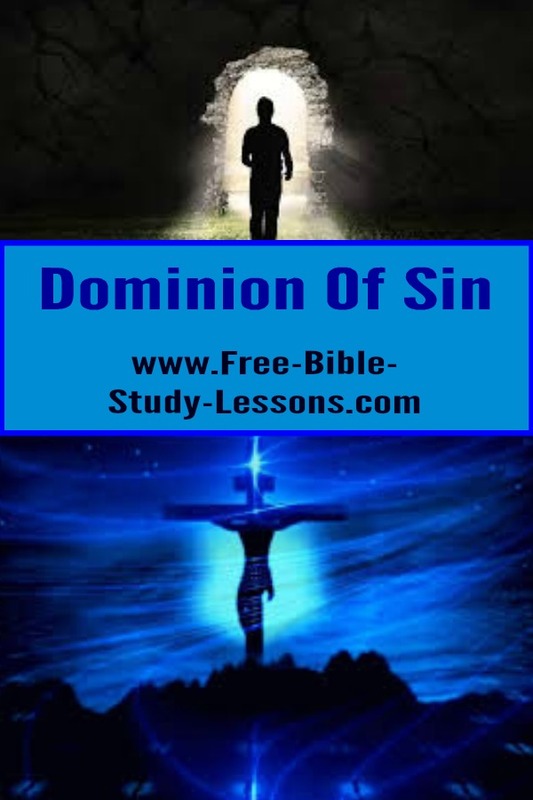 You are free from the dominion of sin. Sin is powerless over you because you are in Christ and sin is powerless over Him. When we really see this there will be no condemnation for those who are in Christ. When we choose to yield to sin, instead of running away from God and spending time in depression and condemnation, we will run to God ask His forgiveness and INSTANTLY continue to walk in relationship with Him. The power of sin to bring death [separation] is broken forever at the cross. If we truly understand this we will be overwhelmed by the grace of God. 2. You don’t know my sin, it controls me still. Temptation and sin can have a powerful pull on our lives. Sometimes we are tipped up again and again, but that has NO effect on our relationship with God if we come and seek forgiveness. We do not stand before God on the basis of works. Yes, we struggle with sin and we will continue the fight until the day we die. Removing sin from our lives is a life-long project of the Holy Spirit. It can be progressively removed because we have been born again and our desire is to follow God. It takes work and sweat, but NOT to earn our relationship with God. d] Continue growing in your relationship with God - don’t let the devil have the satisfaction of disrupting your relationship for even a second.